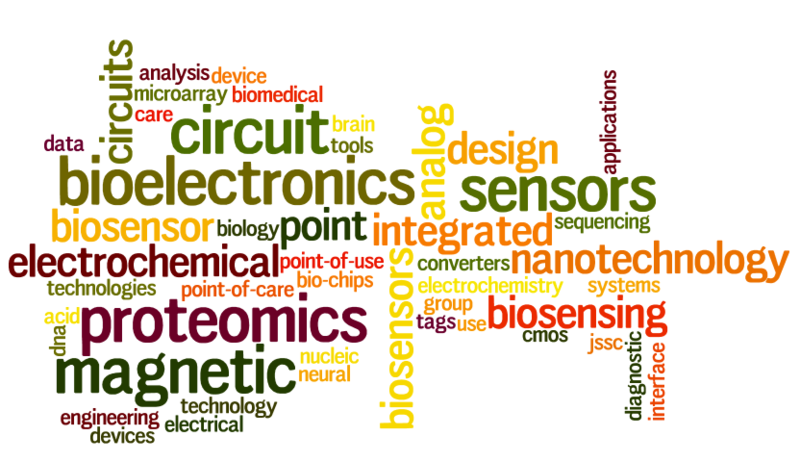 The BioEE group at the University of California, San Diego (UCSD) led by Prof. Drew Hall is a multidisciplinary research group performing innovative research in field of biosensors and bioelectronics. The group uses CMOS circuit design and nanotechnology to develop novel medical devices that address various challenges in biotechnology. Specifically, the group is interested in applications such as in-vitro diagnostics, DNA sequencing, proteomics, point-of-care (POC) testing, neural detection and stimulation, healthcare monitoring, and smart medical devices. With a significant increase in the availability of portable and network connected devices over the last few decades, the infrastructure already exists to be able to integrate medical diagnostic tools with mobile technology. Taking advantage of this opportunity, the Hall research group is working on developing low-cost, point-of-care (POC) biosensor devices, which allow users to test biological samples, analyze data, and aggregate the results for study by medical professionals all without the need for a centralized laboratory or bulky and expensive equipment. There are several projects currently in progress that fall under the umbrella of mobile Health (mHealth). With the focus on leveraging the functionality and widespread use of the smartphone, especially in developing countries, we are designing two versions of a low-cost smartphone-based biosensor. The first is a low-power, single-channel potentiostat to be used for electrochemical assays and the second is a wireless, multiplexed version with added sensors. We are also working in partnership with industry to integrate biosensor modules directly with smartphone hardware. On the transducer and bio-chemistry side, we are investigating novel methods of functionalizing electrodes that decrease the cost per disposable test strip making these POC devices more practical. Finally, the compact and low-cost nature of electrochemical techniques has allowed us to combine our electrochemical biosensors with optical biosensors for improved detection on Lab-on-Chip type devices. This project aims to integrate CMOS electronics with a versatile single molecule detector, the nanopore. Biomolecules, such as deoxyribonucleic acid (DNA) or proteins, can be guided through a nanoscale aperture (referred to as a nanopore) one molecule at a time, resulting in signatures that reveal characteristics of the passing molecule. As single-stranded DNA translocates through a nanopore, each nucleotide induces a blockage in the ionic channel, creating a unique current signature. However, the fast translocation speed of 1-10 nucleotides per microsecond and small current changes of 1-10 picoampere, which are superimposed on a much larger baseline current of 1000 picoampere, pose significant technical challenges on the measurement circuitry design. In the Hall group, we are researching how to design low-noise and high-speed transimpedance amplifiers to sense these minute current signatures. An inexpensive single molecule biosensor will have a tremendous impact in areas as diverse as medicine and health, both domestically and abroad. Magnetic biosensors label a biological molecule (typically a protein or single stranded DNA) with a magnetic nanotag. The number of magnetic nanotags is quantitatively sensed with underlying magnetic sensors. This technique allows extremely sensitive detection (femto-molar concentration), broad dynamic range (up to 7 orders of magnitude), and a high degree of multiplexing. Furthermore, magnetic biosensing offers several key advantages over conventional optical techniques and other sensing methods. First, the samples (blood, urine, serum, etc.) naturally lack any detectable magnetic content, providing a sensing platform with a very low background signal. This is a significant and fundamental problem with many optical techniques where one encounters label-bleaching and autofluorescence. Second, the sensors can be arrayed and multiplexed to perform complex protein or nucleic acid analysis in a single assay without resorting to bulky optical scanning. Additionally, the magnetic tags can be manipulated with a magnetic ﬁeld to potentially speed up the reaction or remove unbound tags. Finally, the sensors are compatible with CMOS IC technology, allowing them to be manufactured with integrated electronic readout, produced in mass quantities (potentially at low cost), and deployed in a one-time use, disposable format for point-of-care testing. Electrochemical sensors label a biological molecule with an electrochemically active label, rather than a magnetic nanotag as in magnetic biosensing. Electrochemical sensors have the benefit of being very easy to manufacture and monolithically integrate with CMOS electronics. However, they typically suffer in sensitivity when compared to magnetic sensors and other sensing modalities. Some of this loss in sensitivity is able to be recovered when one considers nano-scaled electrochemical sensors. With rapid progress being made toward the $1,000 genome, the focus of medical care will shift to a large dependence on proteomics. While DNA holds the “recipe” for how to make proteins, DNA is relatively constant over time. An individual’s proteome, on the other hand, is constantly changing. Proteins are up-regulated, down-regulated, and even completely switched on/off according to the organism’s needs. Ultimately, looking at the proteome is highly indicative of what is going on inside an organism at a given time. Therefore, while genomics may be able to say that a patient has a 5% chance of a being afflicted with a particular cancer, proteomics can determine whether or not the patient actually has cancer and if so at what stage. With rapidly increasing healthcare costs, a constantly expanding population, and a limited supply of physicians, radical changes must be made for the healthcare system to remain sustainable while simultaneously improving the quality of care. A compelling solution to this pressing need is to alleviate some of the burden on the healthcare system and physicians by equipping the general population with the tools to make their own rapid and accurate diagnoses. While there will always be a need for physicians to treat complicated diseases, manage multifaceted treatment regimens, and perform surgical procedures, there are several aspects of the current healthcare system that can be streamlined. There has been some progress in this direction with POC testing; however, many technologies currently rely on medical professionals to run time consuming assays. Currently, easy to use POC devices for individuals are still limited to simple scenarios like pregnancy testing and glucose monitoring. By introducing more versatile molecular diagnostic tools for the general public, individuals will be able to manage many unique aspects of their own healthcare, bypassing in many instances costly and time consuming clinic visits. Just as miniaturization of computers, which once filled large rooms, into the microprocessor revolutionized the computer industry, miniaturization of medical diagnostic tools has the potential to restructure our healthcare system in a similar fashion. By moving away from costly and complex biomolecular detection platforms that are constrained to centralized laboratories, one can design medical diagnostic tools which are both cost effective and permit individuals to take an active part in their own health care. Furthermore, my research will make it feasible to bring the same diagnostic potential of centralized laboratories to developing countries, remote ﬁeld settings, airports, waiting rooms, or to the patient’s home. This tag cloud represents the top keywords from my research publications and interests.